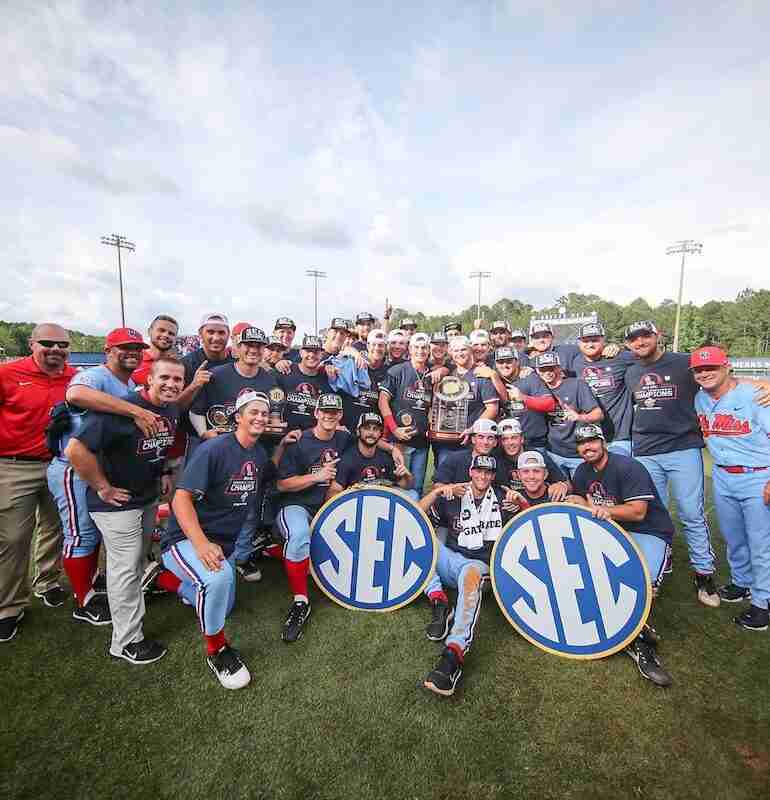 HOOVER, Ala.– In front of an electric crowd of 14,126, Ole Miss and LSU battled on the baseball diamond Sunday for the right to be called SEC Tournament Champions. The second-largest crowd in championship game history–and the first over 14,000 in 15 years–watched as the Rebels dominated the Tigers, 9-1. For the second day in a row, the Rebels came out in fan-favorite, powder-blue uniforms–their usual “Sunday best.” Per SEC rules, the home-team Tigers were required to wear a light color. LSU’s “championship gold” uniforms were deemed a dark color, meaning Paul Mainieri’s bunch would wear white. Ole Miss fans in Hoover, equalling LSU fans in both number and enthusiasm, were treated to quite a show as their Rebels scored nine runs on 15 hits and held LSU to just one run on four hits. With Ole Miss playing its fifth game in five days, head coach Mike Bianco looked to a “pitcher-by-committee” strategy. Sophomore Houston Roth started on the mound in what was his second appearance of the tournament. The Oxford native threw 4 ⅓ solid innings. After LSU’s initial run in the first, Roth settled in and retired the Tigers in order in the second. He finished with just one run allowed on four hits, notching four strikeouts and only walking one. In the bottom of the fifth inning, LSU’s nine-hole hitter singled with one out, prompting Coach Bianco to look to the bullpen for a fresh arm to face the Tigers’ Zach Watson and Antoine Duplantis. Bianco called on senior Will Stokes, who answered by striking out Watson and inducing a fly ball to center field from Duplantis. After five innings, the Rebels held a 3-1 lead over LSU. After a leadoff walk in the sixth, usual Friday-starter Ryan Rolison entered the game for the Rebels, making his first relief appearance of the season. With the bases loaded, the draft-eligible sophomore struck out Jake Slaughter and Hal Hughes to get out of the inning unscathed. It was the last major threat the Tigers would mount, as Rolison pitched a 1-2-3 seventh inning. He recorded the win, his ninth of the season. “It was an awesome experience to get in there in the SEC Championship and pitch,” Rolison said after the game. Bianco then turned to Long Beach native Greer Holston for the eighth and ninth innings. The sophomore allowed one lone walk, struck out one, and retired two on groundouts as the Rebels led the Tigers 9-1 going into the bottom of the ninth. The four Rebel hurlers combined to allow only one run on four hits. Ole Miss hitters brought relentless pressure to a taxed LSU pitching staff playing its sixth game in six days. In total, the Rebels scored nine runs on 15 hits and, in a somewhat amazing stat, left 10 runners on base. The stranded runners did not matter as the Rebels would not be denied. Ole Miss scored single runs in the second, third, and fourth innings, along with six runs in the last three frames. In the second inning, Will Golsan and Chase Cockrell combined on singles which scored Golsan and tied the game at 1-1. Catcher Nick Fortes gave the Rebels a 2-1 lead in the third when he manufactured a run by singling, stealing a base, advancing to third on a fly out and scoring on a wild pitch. Leading off the fourth with a double, second baseman Jacob Adams subsequently scored on an infield single from Fortes that gave Ole Miss a 3-1 lead over the Tigers. In the seventh inning, the Rebels broke things open and put distance on the scoreboard between themselves and LSU. Golsan delivered a huge, two-run single to right field that scored Fortes and left fielder Thomas Dillard, who had reached base via single and walk, respectively. The Captain in the CLUTCH!! @Golzar_08 delivers a huge two-strike, two-RBI single. He's 10-for-21 in this #SECTourney. Right fielder Tim Rowe then added insurance runs in the form of an estimated 408-foot home run to dead center field that also plated Golsan. 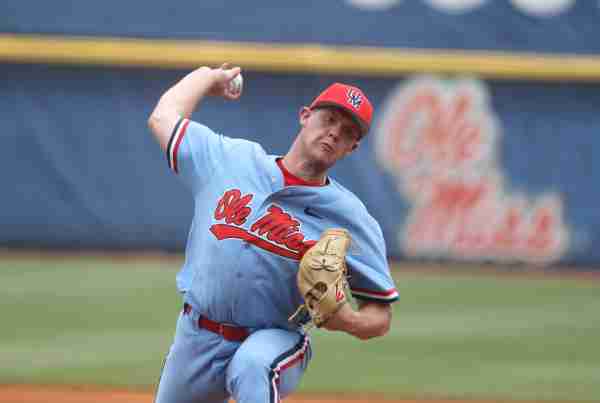 The “icing on the cake” came in the ninth inning from Ole Miss pinch hitter Michael Fitzsimmons who crushed the first pitch he saw into the Rebel bullpen in left field. The home run was the junior’s third of the season in 24 at bats. It brought home Cole Zabowski and gave Ole Miss an insurmountable 9-1 lead. Defensively, freshman Anthony Servideo was pressed into action after sophomore Grae Kessinger tweaked his hamstring running the bases in the first inning. Servideo played shortstop flawlessly, recording three assists while allowing the Rebel infield to roll without missing a beat. “How about Anthony Servideo today?” Coach Lafferty asked after the game. “Two big plays in the hole–that really could change the complexion of the game,” he added. The SEC Tournament Championship is the third in school history and second of the Mike Bianco era. Though LSU is known for the number of Tigers fans who travel to support its team, it was Ole Miss fans who were enthusiastic and vocal on Sunday, garnering the attention of players, coaches and television announcers, alike, as they watched the Rebs take home the title. “It (the environment) is why you come to the SEC, for days like this,” Coach Lafferty said. “You could feel the energy in the park, and I was proud of our kids really using that energy to play well,” he added. “It’s huge to have that kind of fan base behind you,” added Rolison. The All-Tournament team featured several Ole Miss players, led by All-Tournament Catcher and Tournament MVP Nick Fortes who hit .555 for the tournament. Fortes was asked how it felt to be recognized as MVP. Left fielder Thomas Dillard and centerfielder Will Golsan were also named to the All-Tournament team for their performances in Hoover. Get ready Rebels fans as the Oxford Regional has been announced! The teams joining Ole Miss in Oxford will be revealed on “The Road to Omaha” selection show which airs Monday, May 28 at 11 a.m. on ESPNU. Most experts agree the Rebels have earned a coveted, top-eight national seed. That would pave the way for the road to Omaha to travel through Oxford if the Rebels win the Oxford Regional. Regional play is scheduled to to begin Friday, June 1 and continue Saturday, June 2; Sunday, June 3; and Monday, June 4 (if necessary).